This article was published in 2010 and I don't use Windows Operating system anymore. If you got a successfull install, please write it in the comment with leaving details about your operating system to help other. Thx. 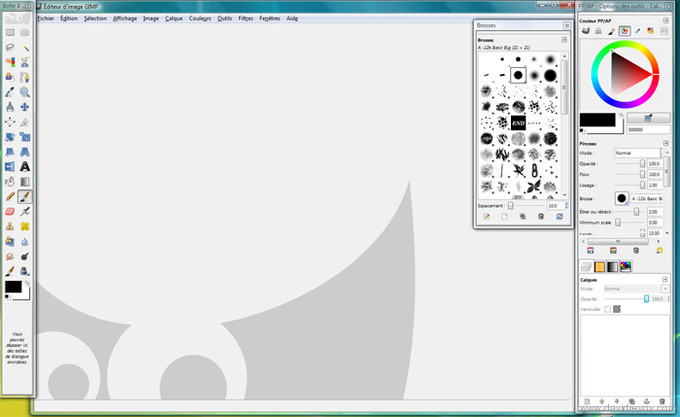 Gimp-painter is a fork of GIMP, the famous free open-source GNU Image Manipulation Program. This tool is my main painting program ( but running under Linux Mint ) on working on the Concept Art of "Sintel" on the Durian project, and on the workshop DVD Chaos&Evolutions. As I see many user want to use it on Windows, I post here a how-to do a clean install of it to enjoy it even on a non-free system. This step by step was screen-captured on a Windows Vista 32bit. I presume it will be almost the same for Seven and Xp users. If you want to complete some details for other windows system, use the comments : thanks. If you know how to install on 64bit system ( I didn't own a system like this so I can't test ), please use the comment of this post too. Thanks for your contribution. 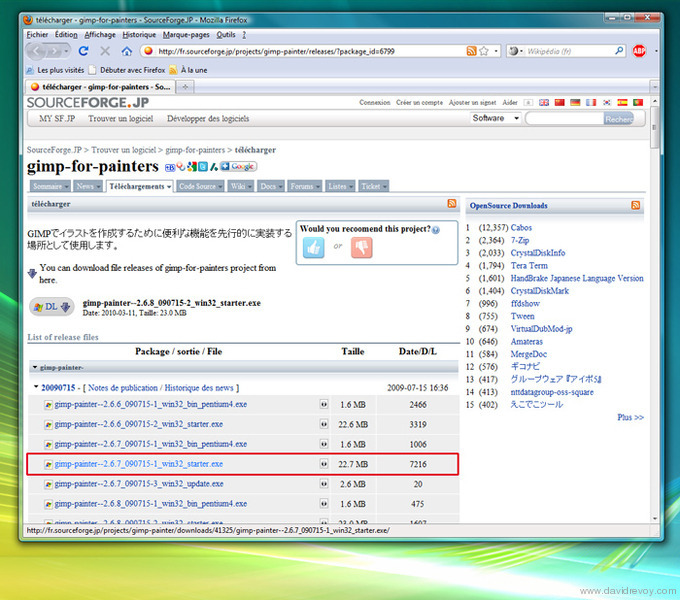 update : (june, 2011) The author of Gimp-painter removed on Sourceforge the version used in this tutorial. He deliver instead a newest version including minor bugfixing ( no new feature ). I didn't tested this newer version because now I run Linux Mint only. 1. Click on the *.exe file installer. 2. Answer to the permission for right to execute of your system. 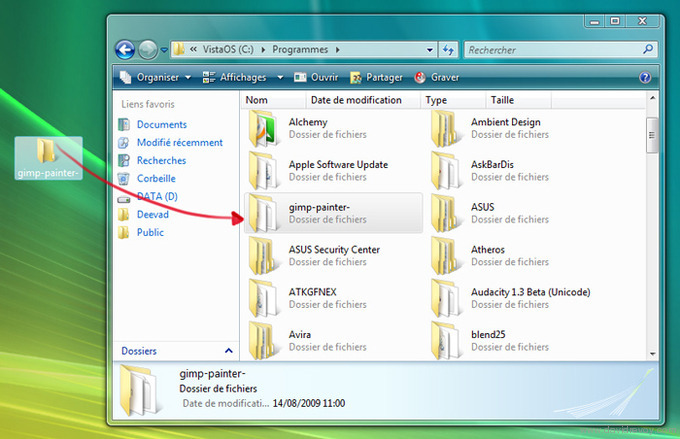 You obtain a folder 'gimp-painter-', open it to check if it's the same as on the screenshot above. We will move it to a place with our other softwares. 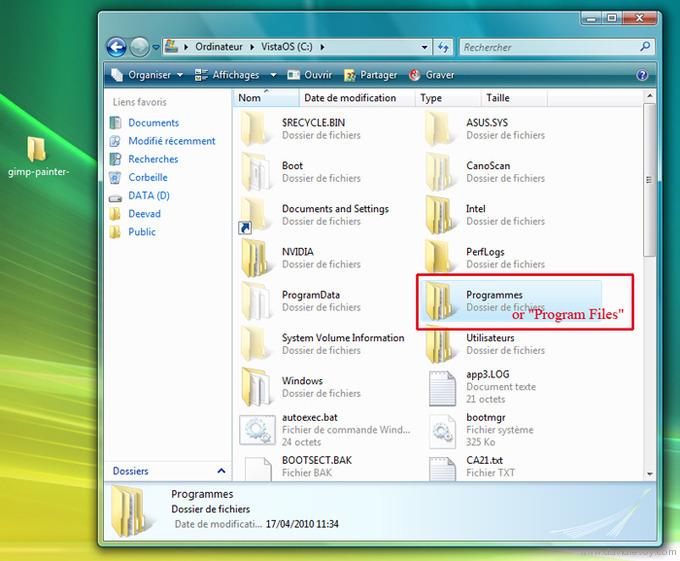 Open the "programs files" folder of your system, it's may be written with your system language. 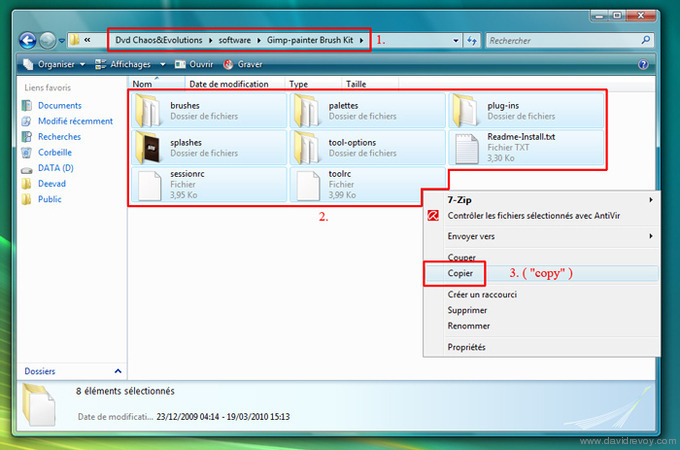 And copy paste in it the folder 'gimp-painter-', your system may ask some permission to write on this system file. Accept , it's OK. Inside there is a file named 'Gimp-2.6.exe' that's the main file too launch the program. Test with opening it if your Gimp launch. If it launch ( first launch may be long ) succesfully, just close it. -You should obain a shortcut (4), rename it if you want. 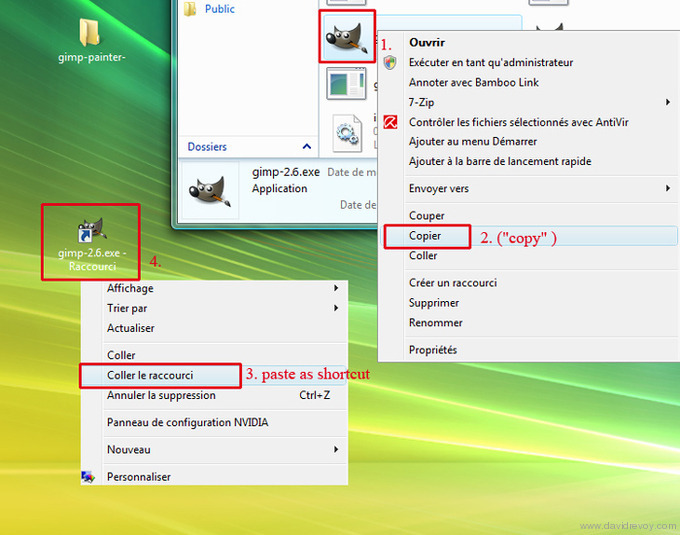 You can repeat the previous step to copy a shortcut in your taskbar, and in your Windows 'start' menu for a better comfort. 3. Right click and press "copy"
2. 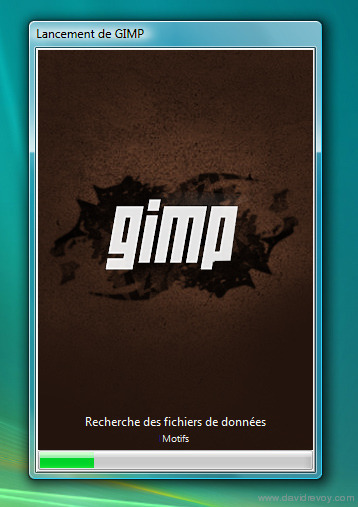 Find the folder named '.gimp-2.6' and open it. Done, close all windows. Clean the first *.exe installer file downloaded (delete it ). And launch Gimp-painter with the shortcuts you created. If you see the splash screen above on running it, it mean the brush-kit is well installed. 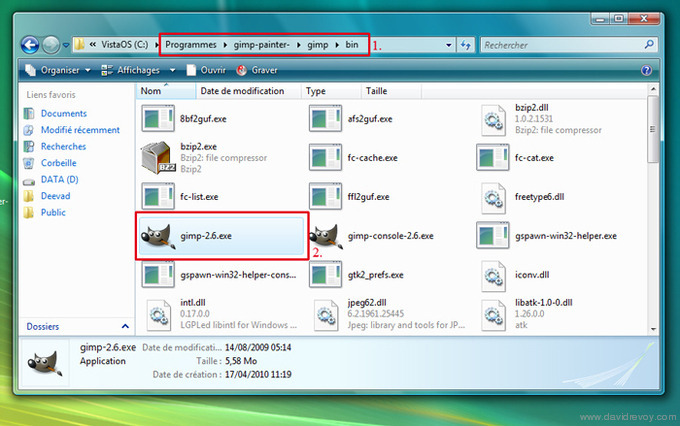 Now, Gimp-painter is installed on your windows System. Have fun with it. If you want to know more about how to use it ; watch the DVD chaos and evolutions or learn how to use Gimp with the full documentation online and in many language. Have fun with Painting ! License: CC-BY David Revoy, www.davidrevoy.com, 17 april 2010 . Thanks — excellent build! Gimp Painter it's very cool! Thank you for this tutorial. It's the best explanation in whole Internet. Working great. Sauriez-vous où je pourrais trouver un build 64bits? Thanks! I found your site by accident and since then have kept coming back. Just bought your CD and and got your brushes! Thanks! Reçu ton cd ce matin, merci pour ce tuto sur gimp painter et ce petit kit de brush sympas ! Au plaisir de te revoir un de ces jours sur les forums (ou autre). Hi David,congratulations for your blog! I've a problem with the shortcuts configuration. I can't find the short cut for more dark, more light, more opacity and less opacity.Where are they? 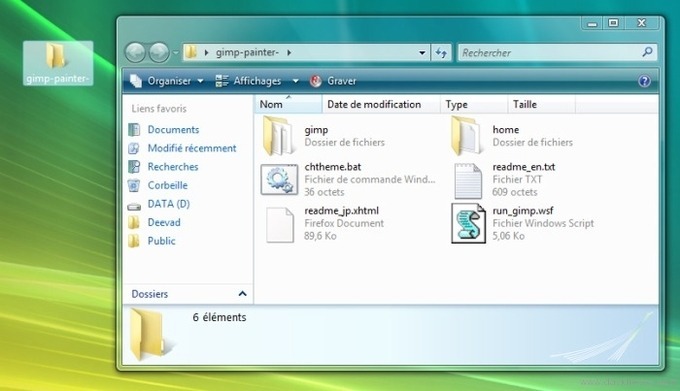 what is the difference between gimp and gimp-painter... is it just the icon position or there's a better support for tablet, because when i used gimp on my windows xp using a tablet, the pointer is lagging and couldn't keep up with my move, while on photoshop the pointer is extremely responsive. Did gimp-painter perform better when i use tablet? I keep getting an error after gimp finishes loading. Tried searching every where but can't find an answer. Can you offer any help on this? Windows XP 32-bit. This error only happens with Gimp-painter, Gimp works fine. @José : Witch version of Gimp works fine ? If it's a newer version ( 2.7x dev ) Gimp-painter may have a conflict to run newer library installed. May be you should try older version on Sourceforge. 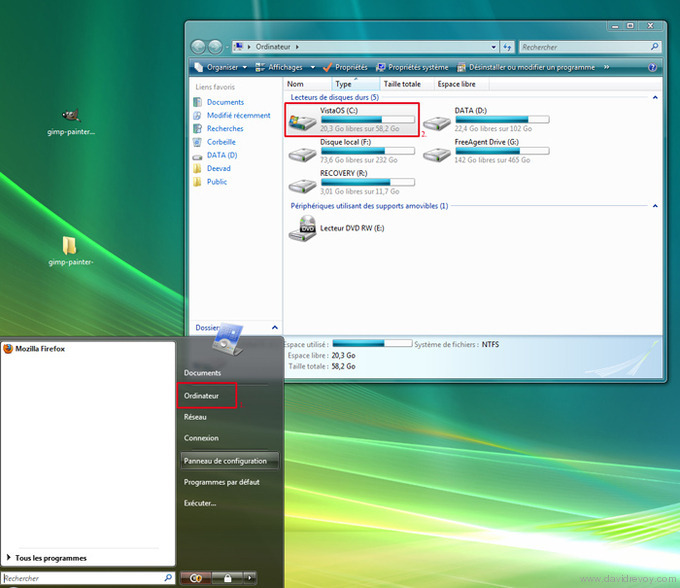 On this tutorial I installed the 2.6.7X without any problem on a vista but also experienced it on a XP 32bit. Maybe the last build for windows 32bit ( 2.6.10 ) is corrupted , but I have no way to chack it, I didn't have a windows system to check it now ( I use Linux mainly ). I've been trying to get Linux Mint but after trying to get everything working properly it quickly fell apart and couldn't even startup anymore, so much for that. Did you tried with an older version of Sourceforge ? like 2.6.7X ? Yeah, I'm still getting the same error. Sorry, I can't help more. May be the problem is with your system. Surely user of the forum http://www.gimpusers.com/forums will help you better as I actually can. It probably is seeing how cluttered it is, I even get this error message every time I startup but doesn't seem like it's doing much harm, I probably should get it fixed. Thanks for the help offer thus far and keep up the good work. Thank you so much for this!!! I spent the last hour or so just trying to figure out how to get this working. @ all : thanks for your contributions with your comments about your experience and tricks to solve issues. Don't hesitate to share like KitKit how you did a succesfull install. Thanks ! -Since its a script and not a exe, when i add it to my seven toolbar, i becomes "Microsoft windows based script host", i have to right click and select the right wsf. That's not really handy. 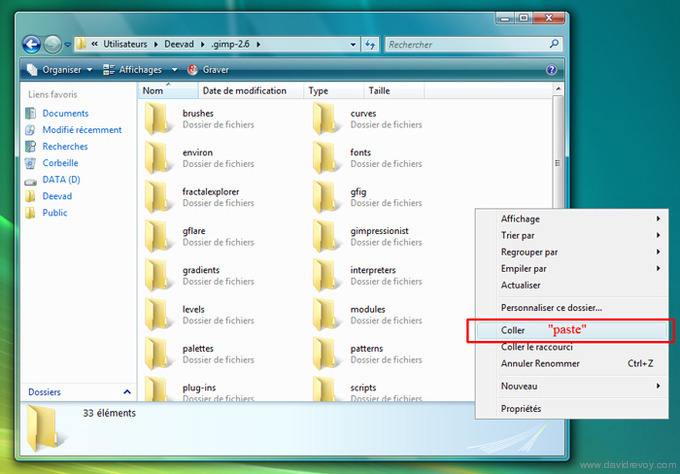 -And since it's a script file, I can't open my pictures with gimp painter from my windows explorer. Does the application recognition (for the wacom driver) works in gimp painter? I want to set a specific configurations for my stylus but the gimp's exe is only recognised as active when my cursor hovers the menus (not the canvas). I wanted a button to do "ctrl" when I'm in gimp and I can't get it to work. Oh btw : I have Seven 64 bits and intuos 4 medium. pour David : J'adore votre travail, vous êtes une des personnes qui utilise le plus astucieusement la technologie au service de l'art et vos efforts pour pousser l'open source donnent chaud au cœur. Je tente de supporter gimp et blender depuis presque 5 ans et vous faites ça à merveille. J'espère pouvoir vous rencontrer à la conférence de Amsterdam! @Michael : Hard to help more about, it's almost since this blog post I didn't open a Ms windows session. I know that I didn't used the script provided with the archive ; but directly the *.exe on the bin directory ( I think ). For the intuos recognition, Gimp as to be setup in the preference panel to be 'linked' with the tablet. For the mapping of 'Ctrl' on a button of the stylus ; it can be done with the Wacom driver under windows : this one is able to load a set of definted shortcuts for an application specific. I really think about moving to ubntu or mint, I try every 6 months but I always miss something from windows. I need a software to do MAO for example and I find Ardour not really convenient. Also I will start doing game development with cryengine 3 (which will have a new license for indie dev in august) and I am not very confident that wine will be able to handle it properly. I might go for a painfull dual boot. Anyway thanks for the gimp's tip, I'm goin to try experiment with that :). Oh, I have another question : Are gimp-painter's tools faster on linux? I would say so but I haven't got the chance to try atm. @Mickael : Thx ! Yep, dual boot is painfull , but I totally understand if you have creative ability on Ms you can't have with Linux. For the Gimp-painter performance ; I would say a little better, something like 2% or 3% more smooth , so nothing fancy ; the best point is about the stability, on Linux Gimp is stable ; on windows I experienced crashes by the past. I think I will set up an linux mint just to try the blender gimp mypaint alchemy combo with better integration and stability (and also a cool darker theme for gimp). Also playing with compiz and intuos display can be fun ^^. Thanks for telling me about your experiences! I just saw this afternoon that mint came out of RC (11th version) today, I will try this newt week :). I love your work and the Blend & Paint DVD!. After seeing that I decided to give Gimp and Mypaint a try. But I have a problem. I run windows vista (yes I know ;-S)and I can't for the life of me export to .ora from Gimp-painter. I have python (2.6.5 and 2.6.6 after that) installed and the GTk+. I've even tried installing normal Gimp 6.11 for the "python extensions" (because gimp-painter doesn't have an installer, just an un-zipper). But I had no luck, I can't export. So basically MyPaint is unusable (even when I love it's powerful simplicity)for me since it uses just the ora format... any help? I found this tutorial endlessly helpful, myself. Thank you! My problem is the second time I went to open gimp-painter, in the same exact fashion as the first time (which works well enough to paint several pictures and a tutorial), it crashed once all of the dialogues opened. And again. And again. And again. I tried running the script, as mentioned, and it fixed nothing. Is this a reinstall issue? A know problem? Whatever it is, it's sort of making my work difficult as I need to use the GPen for a commission. Any tips or advice would be great! @Athena D. : Hi ! May be it's related to the last *.exe files of the author; check this page long list ; http://fr.sourceforge.jp/projects/gimp-painter/releases/?package_id=6799 , and choose an older version. ( as a 2.6.7 ; maybe it will run easier on your system. I wanted my tablet (intuos 4 M ) to work with gimp this weekend, it's a fail. I just want one simple thing : My stylus button to stop doing "right click", I can't manage to do that, and I'm on windows (seven 64), so it's supposed to work out of the box. Even if in my driver it put any function on my stylus button, it will always do "right click" on gimp (or gimp painter). It doesn't take in account anything from the driver (just for the stylus buttons). I might reinstall my computer newt week but if it doesn't fix my problem I don't know what to do. I tried to go in gimp's preferences to associate (or something like that) my stylus but i find nothing interesting here. How am I supposer to paint without color picker in my hand :(? Ok I investigated a bit more and i found that in fact the application detection works, even with gimp, it just solws the cursor for 5 seconds and changes configuration, that's ok. So I found that in fact, gimp always assign first stylus button to right click and second to middle click. If i change this in my driver, it will do both in gimp! Example : I set up my stylus button to make "ctrl" or anything else to bring up the color picker. Once in gimp, I use the button, it's like I did "Right click" then "ctrl", so it pops up the context menu each time. This is unsuable, Am I alone with this problem? If yes I will format my computer I guess, I'm a bit desperate. @Michael : I'm sorry for you for the problem you experience with Gimp on your windows installation. Here I run it on Linux Mint 10.10 and it works like a charm and I didn't opened a windows Os since may be the creation of this article. Maybe you can find more specific help on a forum of Gimp and windows users ? Yes I think i will try to find help at gimp and wacom forums. The strange thin is that I tried every google I could think of and it seems like people only have problems withs stylus pressure, but for me it works like a charm. I should try official forums more often, I didn't find a solution but I found an answer. Functioning of mouse buttons are hard-coded into gimp and cannot be tweaked. With a wacom tablet, stylus buttons are recognized as mouse buttons, even if you change parameters in the driver. So with the way gimp currently handles stylus as "enhanced mouse", you can't assign functions to stylus buttons. This issue doesn't come up in linux, since you can really make the linux driver uses stylus buttons exactly like keys on the keyboard. The best alternative I found is to assign a the color picker keystroke near your other keyboard shortcuts. For example, "P", "M" or "!" on the azerty configuration David uses. Another powerful way to assign the color picker is to use the space bar. That way you still uses your two fingers to change opacity/value/size, but your thumb can sleep on the space bar. I am pretty sure it can be as efficient as having it on the stylus, since you don't have to look for the keystroke. I'm actually checking the sourceforge site and it appears that all of the older versions for Windows are gone? I can;t find anything past 2.6.11, which is the version I have, I believe. Sorry to bother you again, but is there another place that may host an older version? @Athena : Oh, you're right, sorry for the link I gave you I saw a lot of date and files, but in fact there is only the *.diff files and few patches. Not full builds. I think the author deleted them from this repositery. I will probably update the tutorial too. In the end, I found that Ctrl for eye dropper is also hard coded into gimp. So I use "z-e, s-d,x-c" instead of "i-o,k-l,;-:" for regular shortcut and my little finger stays on Ctrl (it's comfy so I'm happy with it). I had so much trouble getting all this to work(gimp + mypaint + scripts, tablets, integration to windows seven etc. ), I think I will make a complete tutorial to help out all windows users who want to give a try to open painting softwares. I'll publish that on my website and put a link here, hoping it will help some people. Thanks so much David! I really appreciate the extra effort you went through to help me. :) I'll see if that works, I have no reason to think it won't. @Michael : Wow ! this could be an amzing ressource. Be sure I would blog post about your link and article, and also update the header of this one to redirect to your method. Cool ! I left work a bit earlier to start working directly on the "open drawing package"
The package is still uploading, should be up in less than half an hour and I'll post the link to it right after (total weight : 200 mo compressed in 72). There are still spelling mistakes and some area could be a bit clearer but that's the first draft. I will maintain and improve this package and instructions as I learn more and as news versions come out. As you can see David if you read a bit, I promote your work in it ^^. And the package is made in consideration of what you explain in terms of workflow in your DVDs. @Michael : Very good job ! this ressource will surely be a huge help for many many users. I will blog post ASAP your link http://vegeti.fr/index.php?option=com_content&view=article&id=59:the-open-drawing-package. Thanks too for the good feedback about my DVD. Thanks a lot for that :)! I think it's time for me to start maintaining my website better and more often. At the moment I'm just struggling with joomla to get my template working with the new version, it's a bit horrible to manage... That's why the link for open draing package will only be up and finale tomorrow or friday (since I'm french too I won't work those days and be able to concentrate myself on my website :p). It's funny what you're saying about CSS3 because I experimented that in my current internship last month (i make simple websites and webdeisgns) and I said the same things to myself! But I didn't know about google font API before yesterday and it seems to be a real opportunity for webdesigners! Fonts have always been a problem, I am coding a web Button generator that outputs svg files at the moment (the future IMO), and I have to convert fonts to shapes in my code if I want my SVG files to embed custom fonts. I am a bit struggling here too haha. @Michael : Oh, I never thought about svg for button. This sound really good. Thanks for the tip, I will read about. Don't hesitate to poke here when your new website will be ready. Good luck! I sent you a mail (hope you received it). Hello, I wondering, Which one do I install if I can't find the one you listed? Which was at 22.7 MB. I don't know why but I just can't seem to find the one listed in this tutorial. @ClockWork : The author removed the version I used, I kept here the similar version I used in this tutorial : http://david.revoy.free.fr/forums/support/gimp-painter--2.6.7_090715-1_win32_starter.exe. I will also update the article, feel free to look at this new article about windows install . @Jessabella : Hi, if you don't have the 2 extra tools installed it's because you installed the regular version of Gimp. Gimp-painter is a modified version of Gimp witch include the 2 additionnal tools, and there is not a lot of different links to download it. Voila, suite à un gros plantage j' ai du réinstaller gimp et gimp-painter. Je suis sous windows vista 32bits, et j' ai téléchargé gimp-painter 2.6.11. 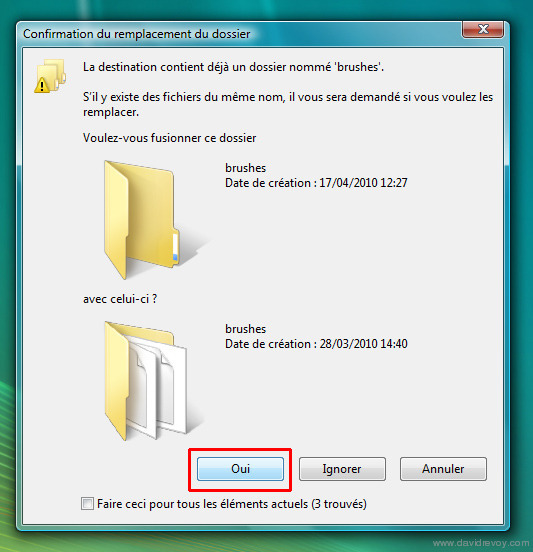 @ghola14 : Pas évident pour moi d'être au courant des bug sous Windows, car j'ai plus ce système , même en dual boot . Est-ce que cette version bug ? 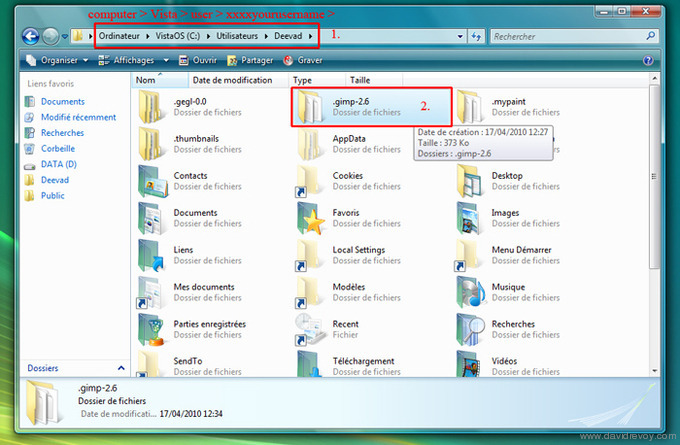 http://david.revoy.free.fr/forums/support/gimp-painter--2.6.7_090715-1_win32_starter.exe ? @a : Are you sure you are using this version : http://david.revoy.free.fr/forums/support/gimp-painter--2.6.7_090715-1_win32_starter.exe ? Thanks Mr. David, I love your work on Sintel. I have a problem with gimp-painter with GPS. the GPS presets work well on normal GIMP but on painter the GPS preset wont select the right gradient and texture. For example the HellFire or RocketFire Preset on brush have a corresponding gradient but when i select it on gimp-painter the proper gradient does not get selected, eiter I got the default or the last gradient I selected. Thanks, I hope you can help me (I love painters mix brushes and G-Pen) and i miss them when i switch to Ordinary GIMP. @kaisaki : Hi ! I think this is a feature of Gimp-painter to prevent the loading of embeded link to gradient or texture ( sometimes it helps to load multiple tools on the same color or gradient base ) . To solve your problem : press SHIFT key while selecting them in Gimp-painter. Then the correct color or gradient when saving the preset should be also activated. I checked , it's ok with the 2 preset you quoted. @Cristina : Yes, the tutorial is old and Windows is messy. I will not update this now because I don't own a Windows system anymore. I moved to Linux Mint at 100% . To find new method, just follow the first link in the green box (updates) , it will link you to newer way to do it. 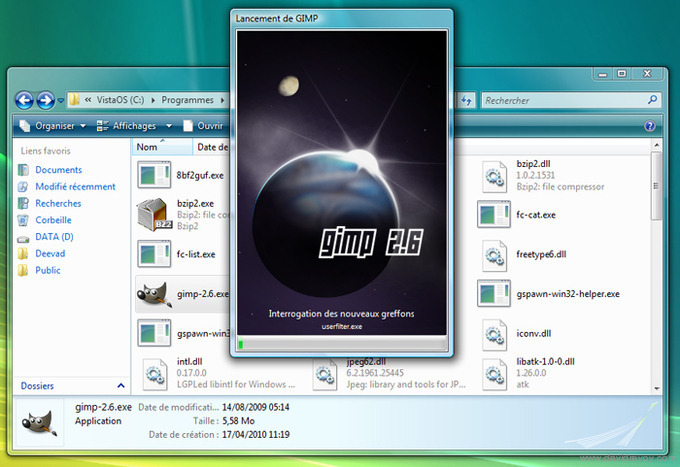 Hello, I've been trying to install GimpPainter, but I getting the message about file "liblcms2-2.dll" missing. I have no idea what to do now. @Kasia : Hey, I'm sorry for you. Gimp-painter maintainer ( he was alone ) don't support his fork a lot, and it seams there is a lot of problems nowadays to install it on Windows ( i don't own here any Windows , I can't test anymore ). I also saw the website with the 'The Open Drawing Package' is down. I hope it's temporary and not a sign the website closed. If not , give a try with this one. Also, please say me the version of Windows and architecture. Microsoft systems now have XP / Vista / 7 and whatever else name I don't know yet, with 32bit and 64bit. It's might help for future users who got the same problems to not feel alone. 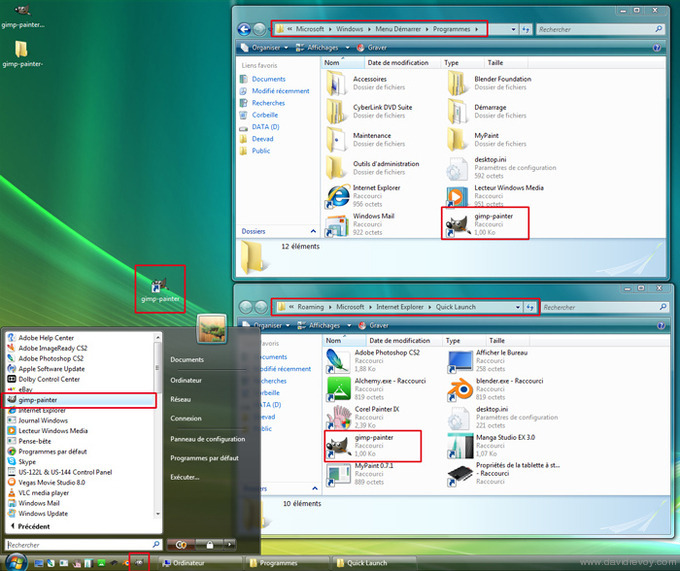 It seems that people with WindowsXP 32bit versions have this problem of missing files. One person of polish Gimp forum claimed that the painter stopped to run while reading "focusblur" plugin (which caused the "missing file" message to pop out). That person installed the plugin and it seems that painter is working normally. I've been trying to do the same thing, but with no results. Btw, I absolutely love "Video time-lapse - lezard" - I watch it over and over again! @Kasia : so cool and cute characters :) I follow you on D.A now :) nice it worked. Thx for the feedback. Unfortunately, there's still something wrong with GPainter (so sorry to bother you again!) - you see, I have saved options for the painter, BUT when I try to use one of those saved presets, I get the info saying that I don't have necessary brushes at all. Also, shouldn't GimpPainter use all the brushes I normally use in Gimp? Should I copy-paste those to GimpPainter folders? Oh, never mind - I'm reinstalling EVERYTHING. Something's not right, but I will be trying to fix it. @Kasia : You're worthy a lot, your little online comics are really cute, and very well drawn. I like your personnal style. Also, I have a polish wife, and I'm really happy to meet polish artist using Free/Libre and Open Source software. Phew, it took me all day, but I think it's finally working... somehow... Some of the brushes from GPS doesn't seem to work in Painter (in my case), but that's an irrelevant issue. Yes, I know MyPaint, but I hardly ever open it - digital painting is just too hard to handle. Thanks for the tutorial! I draw manga style and GIMP Painter really a big help! Just installed Gimp 2.8 and... all my presets for Gimp Paint Studio vanished. :( What a bummer! I tried to install it again - just like with gimp 2.6 version, but it's not working (a lot of people are complaing about it). Thankfully I still have my GimpPainter. Here I use mainly Mypaint + Krita to paint nowadays ; story around Gimp became complex and confuse, and it makes me lost time. Not a good sign of a good design. I may try to build the last code of Gimp-painter 2.7 and test. But I doubt it to be stable enough for production. I try to use it - thank you! @Yumi143 : hi Yumi ; Gimp-painter 2.6 is now abandonned from developpers and I don't use it anymore. So, it will be hard to find support around. Nowaday I use Krita and Mypaint. The smoothing in Gimp painter is available on only 1 tool : the ink brush added ; for the custom palette ; its just a palette docker docked ; a feature every Gimp has. Good luck with it ! Does anyone know how to install gimp-painter 2.8.6 on windows xp? Hello! You still using Gimp-Painter as main painting tool? Is the development of Gimp-Painter going on? Project is live?